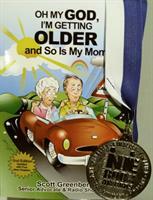 West Palm Beach marketing and publishing company, StarGroup Books, announces that local senior advocate, radio show host, and author, Scott Greenberg has been chosen as a Finalist in the 2018 Next Generation Indie Book Awards for his book entitled, OH MY GOD, I’M GETTING OLDER and So Is My Mom, 2nd edition. Scott Greenberg is on a mission is to provide practical information and expert guidance to senior citizens and their families. Developing a clear plan to meet the medical, living, and emotional needs of a family memberensures that loved ones or caregivers will not be faced with crisis decision-making at a vulnerable time. Mr. Greenberg’s practical advice and real life anecdotes are invaluable to families and caregivers. He is a popular and frequent speaker at industry conferences, seminars, non-profit organizations, community events, and senior communities. Scott Greenberg is host of the weekly radio show, “OH MY GOD, I’M GETTING OLDER AND So Is My Mom”, heard in South Florida and Long Island, NY. He is Chief Executive Officer of ComForcare Senior Services, a private duty non-medical home healthcare agency in South Florida and Jacksonville, Florida. StarGroup Books is the publishing arm of StarGroupInternational, and the recipient of many state and national Indie Book Awards. Custom books are a unique marketing tool used to develop brand awareness and industry credibility, generate media coverage, and raise funds for non-profit organizations.